On Saturday, January 12th, members of Christ the Savior joined Fr. Vasileos and St. George's Greek Orthodox Church of Ocean City, MD, for their annual Blessing of the Atlantic Ocean. The festivities were led by His Eminence, Metropolitan Evangelos of the Greek Orthodox Archdiocese. Many thanks to Fr. Vasileos and the community of St. George for hosting this wonderful event to the glory of God! On Sunday, January 20th, the parishioners of Christ the Savior gathered together for their Annual Meeting. In addition to reviewing the minutes from last year's meeting, the parish body heard reports from the rector, senior warden, junior warden, treasurer, and auditors. 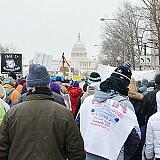 On Friday, January 25th, members of Christ the Savior traveled to Washington DC for the annual March For Life. The march is a pro-life rally protesting abortion, held in the nation's capital near the anniversary of the decision in the United States Supreme Court case Roe v. Wade. This year marked the 40th anniversary of the infamous decision. Many marchers also protest the use of euthanasia. On Sunday, January 27th, Vladimir Bozic and Olga Klymuk were united in the mystery of Holy Matrimony. The service was performed at St. John the Baptist Cathedral in Washington, DC. We heartily congratulate the newly wed couple, Vladimir and Olga, asking the Lord's divine blessings upon them. May the Lord grant them health, strength, salvation, a furtherance in every good thing, and many blessed years! On Sunday, January 27th, His Beatitude Metropolitan Tikhon was enthroned in the nation's capital at St. Nicholas Cathedral as Archbishop of Washington, Metropolitan of All American and Canada. Members of Christ the Savior traveled to join the hierarchs, clergy and faithful in prayer and festive celebration. May the Lord grant Metropolitan Tikhon many blessed years! On Sunday, February 24th, with the blessing of our diocesan hierarch, Metropolitan Tikhon, the 2013 Parish Council members were installed into office. During the first meeting of the 2013 Council, Roberta Dobronz was elected Junior Warden and Deborah Wilson was elected Secretary; Andrew Hageman will oversee the parish grounds. May the Lord bless them all! On Sunday, March 3rd, we had the Baptism of Matthew Nicholas McFarland. We congratulate him, his parents, Michael and Nada, his godparents, Nicholas and Anna Marie Evanusa, as well as the entire family on this joyous occasion. May the Lord grant the newly illumined servant of God, Matthew Nicholas, many blessed years! On Monday, March 25th, the great feast of the Annunciation, Danyella Mary Parsells was received into the Orthodox Church by Holy Baptism and Chrismation. We heartily congratulate her, together with her family, on this joyous occasion. We ask the Lord, through the prayerful intercessions of the Most-holy Theotokos and St. Mary of Egypt, to grant the newly-illumined handmaiden of God, Danyella Mary, many blessed years! On March 18th, work began on one of the last phases of the renovation to the Parish Center: the stuccoing of the walls of the chapel. Work is expected to continue over the next two to three weeks. The mission is currently looking for donors to help complete this project which is estimated to cost $5000. Currently the project is being funded by a short-term loan from one of the families of the church. Please consider offering your financial support to help complete this important work. On Saturday, April 13th, a group of parishioners from the mission traveled to Baltimore for a lenten retreat at Holy Annunciation Greek Orthodox Cathedral. The theme of the retreat, led by Fr. Josiah Trenham, was “The Church as a Spiritual Hospital: God’s Design for the Cure of the Soul”. May the Lord bless all those who made this retreat possible as well as all those who made the pilgrimage for their spiritual edification and mutual encouragement! On Friday, April 26th, the eve of Lazarus Saturday, the stucco project, which began on March 18th, finally came to completion. Apprecation is extended to those who donated towards this work as well as those who labored so hard to complete it before Holy Week. Glory and thanks to be God! On April 27th, Lazarus Saturday, Chad and Maria Stewart were recieved into the Orthodox Church together with their children. We rejoice with them on this bright and joyous occasion, and we ask the Lord's continued blessings upon them, granting them health, strength, salvation, furtherance in all good things, and many blessed years! On April 28th, Palm Sunday, the faithful gathered to celebrate the Entrance of the Lord into Jerusalem. This joyous occasion was punctuated with the blessing of a new Golgotha and the welcoming of Protopresbyter Daniel Hubiak, the mission's founding priest, together with many friends and faithful from near and far. 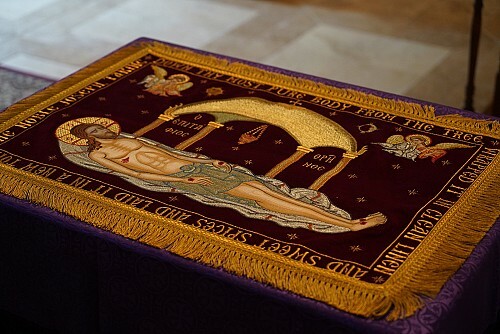 From April 29 - May 4, the faithful gathered at Christ the Savior to celebrated the solemn liturgical services of Great and Holy Week, which commemorates the Lord's voluntary Passion, His Cross, Death and Burial. On Sunday, May 5th, the faithful and friends of the Mission gathered to celebrate the Feast of feasts, the Holy day of holy days, Great and Holy Pascha - the Resurrection of Christ. This historic day, the first Pascha at the new property in Berlin, drew over 100 people who gathered for the liturgical services and a festal meal in the parish hall and rectory. We greet you all with the eternally joyous exclamation, "Christ is risen! Indeed, He is risen!" 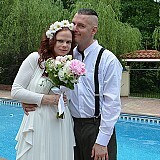 On Sunday, June 2nd, Gregory and Danyella Mary Parsells were united in the mystery of Holy Matrimony. Following the service, everyone stayed for the reception at the Parish Center. We heartily congratulate the newly wed couple, Gregory and Danyella, asking the Lord's divine blessings upon them. May the Lord grant them health, strength, salvation, a furtherance in every good thing, and many blessed years! On Sunday, June 2nd, after four weeks' postponement, the children of the mission finally had their annual Paschal egg hunt. A good time was had by all, and then everyone took a swim for the first time this season in the newly opened pool. On Sunday, June 2nd, a prayer was offered for the annual blessing of the pool: O Lord, how marvelous are Thy works. In wisdom hast Thou made them all. Send down Thy heavenly blessing upon this pool. Protect all who swim in it. Keep them safe as they enjoy the recreation and fellowship which it provides. For Thou art the Provider of every good gift, Who dost fill our hearts with joy and gladness, always, now and ever, and unto the ages of ages. Amen. On Sunday, June 16th, prayers were offered at the completion of the academic year, thanking the Lord for the blessing of His wisdom and knowledge, and asking Him to preserve the students in that which they have learned which is according to His divine law. On Sunday, June 23rd, the faithful gathered to celebrate the feast of Pentecost. 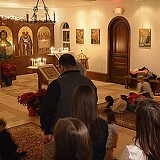 As is customary, the Vespers with Kneeling Prayers was served immediately following the Divine Liturgy. On this day, we also bid farewell to Richard and Charlotte England who are relocating to Illinois. We ask the Lord's continued blessings upon them, both in this life and the one to come! On the weekend of July 6-7th, the faithful welcomed His Beatitude Metropolitan Tikhon for his second archpastoral visit to Christ the Savior Mission. On Saturday evening, Met. 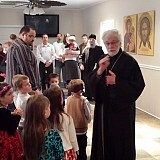 Tikhon met with parishioners for discussion before the Great Vespers service. 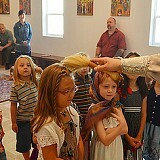 On Sunday morning, at the conclusion of the Divine Liturgy, Met. 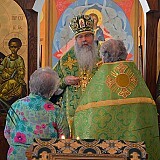 Tikhon blessed an icon of the Saints of North America, which had been given to the parish by Archpriest David Straut. On Sunday, July 21st, the faithful of Christ the Savior gathered for the Divine Liturgy followed by the Blessing of Automobiles. This annual blessing occurs on the Sunday closest to the feast of the Prophet Elias (who ascended as if into heaven in a fiery chariot). 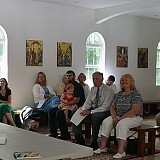 On Sunday, July 28th, over 90 people gathered from near and far to celebrate the Divine Liturgy. Among the serving clergy were Protopresbyter Daniel Hubiak, Archpriest Daniel Kovalak, Archpriest Thomas Soroka, Priest John Parsells, and Deacon Mark Oleynik. 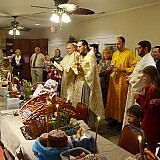 Following the Divine Liturgy, many stayed for the fellowship hour and the open pool. It was a joy to have the venerable clergy as well as all of the faithful visitors to the Mission. Glory and thanks be to God for a beautiful day! 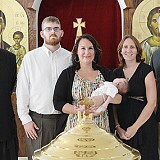 On Sunday, August 4th, we had the Baptism of Augustine Theodore Stewart. We congratulate him, his parents, Chad and Maria, his godparents, Andrew and Kelly Hageman, as well as the entire Stewart family on this joyous occasion. May the Lord grant the newly illumined servant of God, Augustine Theodore, many blessed years! On Sunday, August 18th, at the conclusion of the Divine Liturgy, prayers were offered for the suffering people of Egypt, Syria, and throughout the world, especially those who are being persecuted for their Christian faith. On Sunday, August 25th, a Special Parish Meeting was held to discuss stewardship and the financial plan of the Mission. On Sunday, August 25th, prayers were offered for teachers and students on the occasion of the new academic year. May God grant His wisdom and understanding to them all! On Sunday, September 29th, we had the Baptism of Andrei Ovidiu. We congratulate him, his parents, Ovidiu Dimitru and Ana Maria, his godparents, Ioan and Ionela, as well as the entire family on this joyous occasion. May the Lord grant the newly illumined servant of God, Andrei Ovidiu, many blessed years! On Sunday, November 3rd, the children participated in our annual St. Michael's party, by dressing as saints and angels. Other activities including bobbing for apples, pumpkin bowling, roasted marshmallows, donut tree, and various crafts. Many thanks to all who made this year's St. Michael's party such a great success! 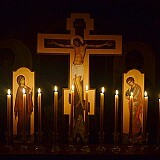 On Sunday, November 3rd, prayers were offered at the end of the Divine Liturgy for those in the healing ministries. We ask the Lord's continued blessings upon all those who work with Him in the healing of mankind's physical, emotional, and spiritual wounds and illnesses. May the Lord grant them many blessed years of faithful service to Him and their fellow man! On Saturday, November 16th, the 2013 Diocesan Assembly was held at St. Matthew's Orthodox Church in Columbia, MD. Representing Christ the Savior Mission were Fr. John Parsells, Fr. Daniel Hubiak, Kathy Parrish, Cheryl Kokkinos, George Kaloroumakis, Constantine Mitsopoulos, and Bill Parrish. Appreciation is extended to all who travelled for the assembly. Glory and thanks to God for all things! This year's celebration of the Lord's Nativity was punctuated with record attendance, as faithful parishioners and friends gathered for worship and fellowship on this high Holy Day. The founding priest of the Mission, Protopresbyter Daniel Hubiak, led the community in the Divine Liturgy, which was followed by a festive coffee hour. As we give thanks to God Almighty, we also ask His divine blessings upon one and all during this season of peace and spiritual joy! Christ is born! Glorify Him! On December 29, 2013, we continued to celebrate the Nativity of the Lord, with an Open House in the rectory. At the conclusion of the Divine Liturgy, we kept the ancient custom of St. Basil's Bread, with the golden coin being received by Monk Christian (Lesinsky). On this day, we also congratulated Protopresbyter Daniel Hubiak on his 87th birthday - may the Lord grant him and Mat. Dunia many more blessed years! Finally, on this day, we reached our goal of raising 30K to repay a short term 0% interest loan generously offered by a benefactor for renovations required to the Parish Center. We have so many to thank, and we offer glory and thanks to God for all things, including such a wonderful day with so many blessings!